WELCOME TEAM MEMBERS, Family Members and Board Members to the 6th ANNUAL TEAM MEMBER APPRECIATION TEA. This year we will be honoring 60 staff who have worked at Menno from 5 to 40 years! This is an accumulation of 745 years of service! We are also recognizing those with Excellent Attendance as well as some special awards for Safety Champion, Creative Solutions and Living our Values. When we gather together in this way to celebrate our success, we are reminded of the incredible privilege it is to share our skills, our hearts and our lives with the residents and their families. 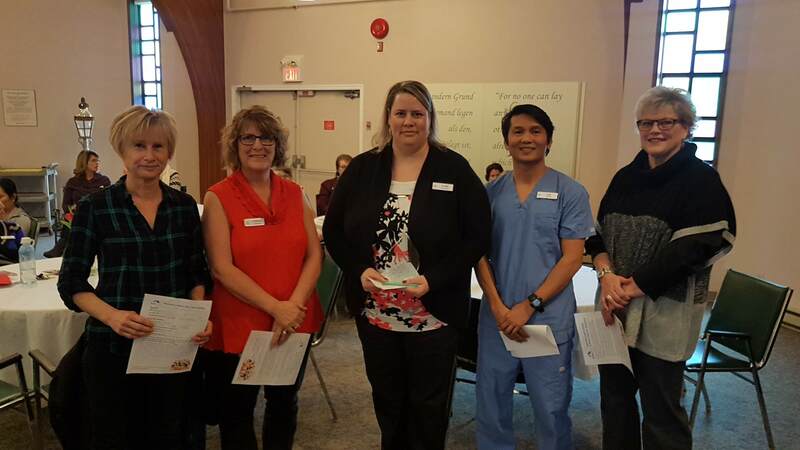 Our staff are the heart of Menno Place – and many of you have been “caught in the moment” this year. Throughout the year, managers and family members have shared with us the outstanding moments that you have had as you have lived out the SERVICE values of Menno Place. Anitha Thomas of Menno Hospital brought forward a solution to the problem of RNs waiting to access lab print-offs. It was a great solution – give RNs access to the lab reports – we implemented this idea and it has solved the issue! Thank you. And at Menno Home… Denise Abbott… was caught in the moment when she created a warm atmosphere for Diane’s retirement in E2. Her thoughtfulness and attention to her colleagues was noticed and appreciated! Thank you. 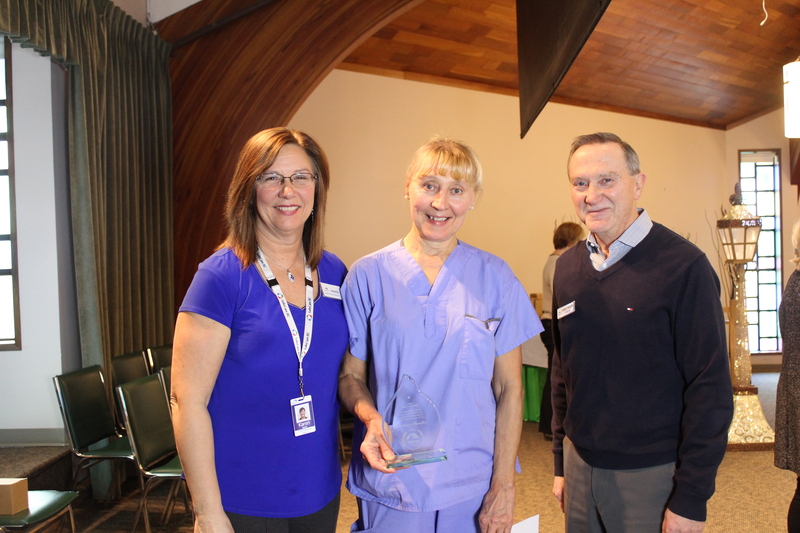 In Menno Hospital, Jennifer Child was thanked for how she engages with residents on E2. 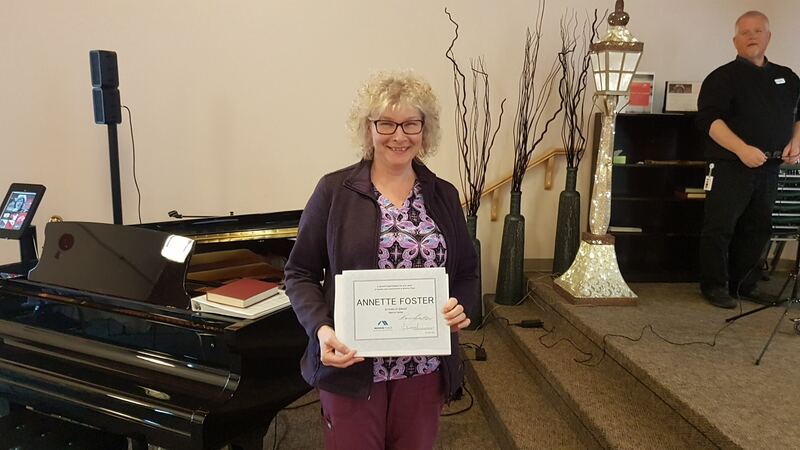 Jennifer’s special attention to a resident struggling with anger was noticed and appreciated. Her daughter was looking for a solution and suggested that we find someone for her to talk with. Jennifer, you took that opportunity and are able to de-escalate her through listening and talking. Thank you. 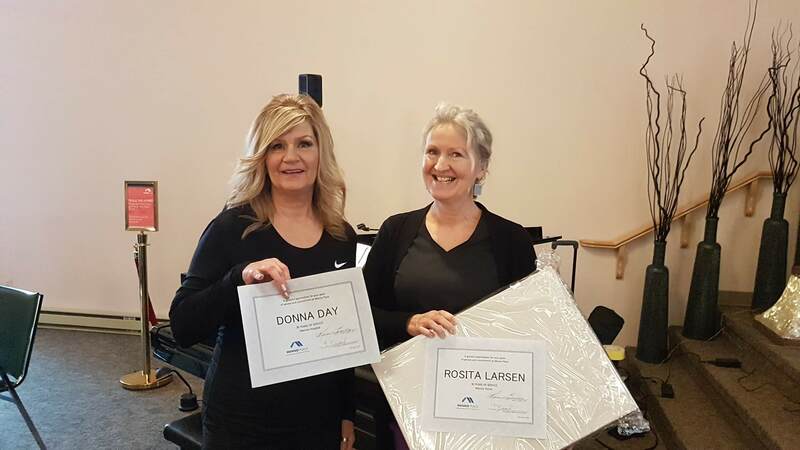 At the Apartments, Lesa Thielman, your manager noticed that you went above and beyond when she was away – helping residents and staff – all with a joyful spirit. Your work is noticed and appreciated. Thank you! And in our Social Work department – Dan Janzen – you were caught doing an amazing job of helping to diffuse the Code White that took place just this past month. You demonstrated composure and calmed the resident. The trust you built with the resident was a key to reducing the severity of the incident. You were noticed and appreciated. Thank you. You weren’t the only one who made a difference in that Code White – Anne Marie took the lead and navigated the Code White for her first time – and Jennifer adjusted her Recreation residents away from the escalated situation. It was a real team effort and the whole of E2 Hospital pulled together to resolve the situation quickly and safely. Thank you. Over in W2 at Menno Home, we’ve received many thank you’s from families, but one in particular stands out – the five sons of a resident who lived at Menno Place for 14 years all said that she could not have been at a better place. When she moved to the Home, she was confident of the excellent care as it was something her friends at Pavilion spoke of often. A staff member who lost her mother last fall wrote to her manager to say how much she appreciates the team in the staffing office – she says, “I have been the biggest fan of Staffing lately. My Menno family is amazing above & beyond and I’m forever grateful for that love & support – the backup and the understanding. I will be returning shortly! Thank you for the support! Thank you, Staffing! Here at the Hospital Reception desk, Leslie Calbick showed her heart and commitment to our values when she coached the casual receptionist through the Meditek program during Leslie’s vacation. She was available on Workchat and she came in twice while on vacation to make sure that the casual receptionist knew what to do and that our new residents could get their prescriptions without any issues. Thank you. As we reflected and planned for this 6th Annual Staff Appreciation Tea, we began to realize that we want to capture these moments of outstanding heart. We are doing just that – managers are submitting stories of your above and beyond work. Compliments and Cards from Family and Residents are passed along to Garry Janzen, our Life Enrichment Coordinator who logs them in the Experience app in Worxhub. In the past 12 months, there are 90 compliments recorded in Worxhub. We know this only scratches the surface of what you are all doing to serve residents each day. 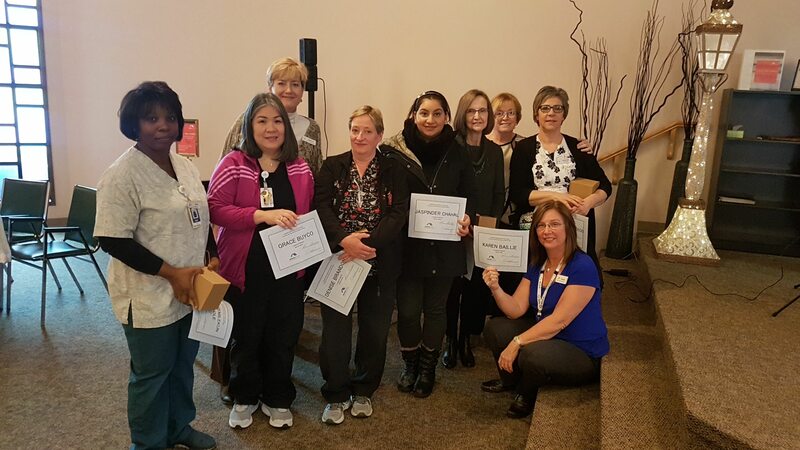 It doesn’t really tell the complete and powerful story of how you work to serve, comfort and care for residents and their families each day – and yet, it tells us something – it tells us that people notice the skilled, kind and compassionate care their loved ones receive here at Menno Place. Last year, a family whose father lived in W1 wrote to tell us that the passing quilt ceremony done by Ingrid was so deeply meaningful to their family. They shared how much it meant that their dad received such care and attention – and they felt that their time at the end with their father was an amazing time for each of them. Thank you. 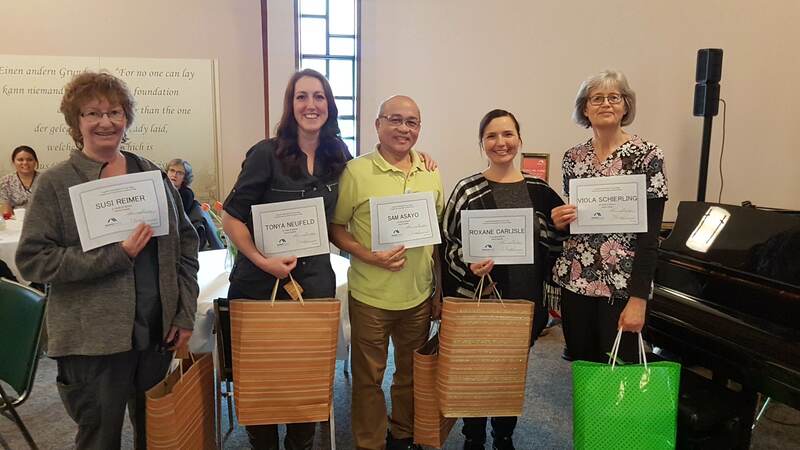 Annette, Megan and Maria – your care and attention for a family member in W2 brought his wife to tears when she said, “this is the best place for Alex. I am so thankful for his care.” Thank you. At E2 in the Home, Mary Jane was thanked by a family that was struggling – the son noticed how much care and compassion the team gave to both his mom and dad. Thank you. When a resident in the apartments passed away in the spring, his daughter wrote about the care team in Assisted Living, “it’s too bad dad wasn’t able to spend more time at Menno. It is such a friendly and caring place.” Thank you. And that, team, is the heart. We know it, we feel it, but sometimes we forget how much it means when we do a little extra, listen a little longer and extend a heart of empathy and care. Thank you for all you do to make this heart beat at Menno Place! This Team Member Appreciation Tea is an event which celebrates the amazing contributions you, the team members at Menno Place, make each day. 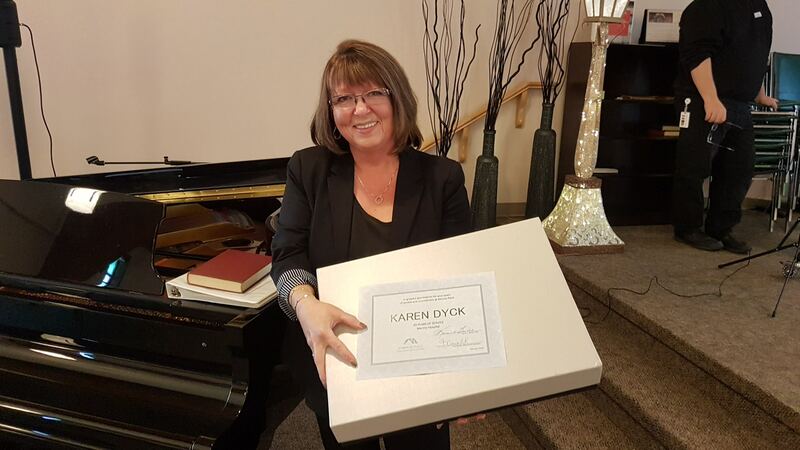 It is a time to celebrate significant milestones in your years of service at Menno and to recognize those who have gone the extra mile in their work where others have recognized it. 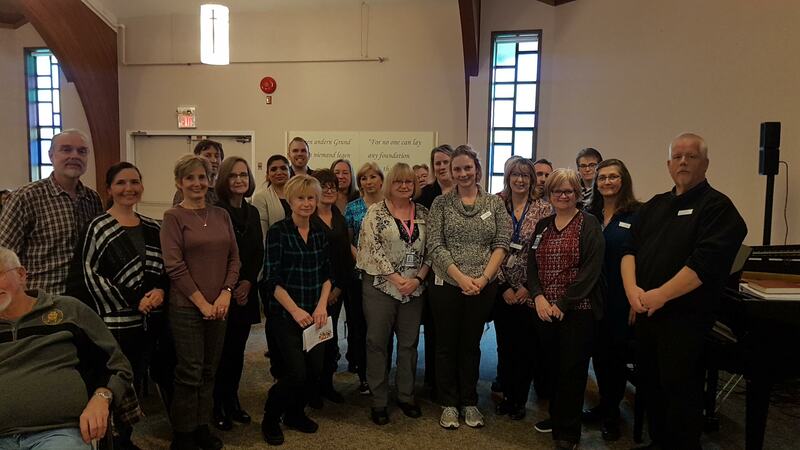 We hope you all feel appreciated for the work you do at Menno – therefore we are all taking part in this celebration with the wonderful goodies the Dietary Staff have prepared for us – Thank you to Dietary for this contribution as well. Now to honor our Staff …. When you hear your name, please come up the ramp, tell Pearl your name. Arnie Friesen, MBS Board Member and Karen Baillie, our CEO are here to congratulate you. Then please stay at the side here until all the staff in your service year are called and we will take a picture. We will start with those with Excellent Attendance…. Now we will honor those with their Service Awards, starting with 5 years of service. 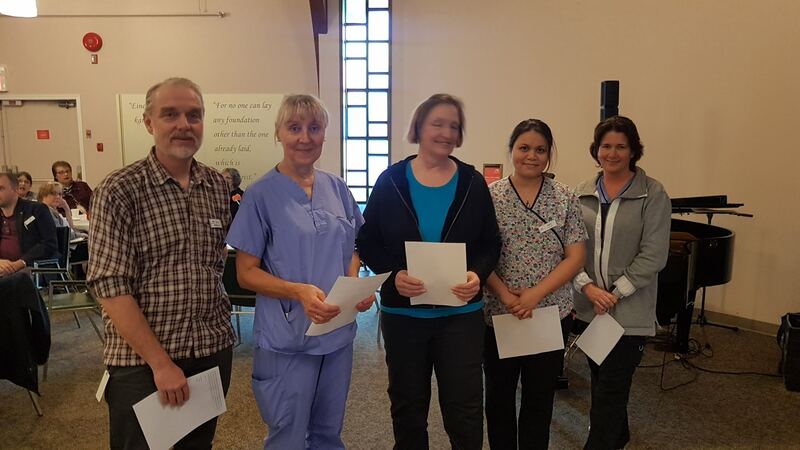 There are 21 team members who are celebrating 5 years of service at Menno Place…..
Now for the special awards. This year, we opened up the nominations for all the awards to staff, residents and family members. There were 62 nominations – 30 from Family & Friends and 32 from Team Members. It was a complete joy to read the nominations, knowing that many of the nominations came directly from the people who are served here at Menno Place. What did the residents and families say about the people who serve them? When the Maintenance team cleaned up the exteriors of buildings in the summer, a resident came by Reception just to say that she was very pleased with the excellent cleaning – and another one came to the Life Enrichment Coordinator just to say how beautiful the grounds are looking. 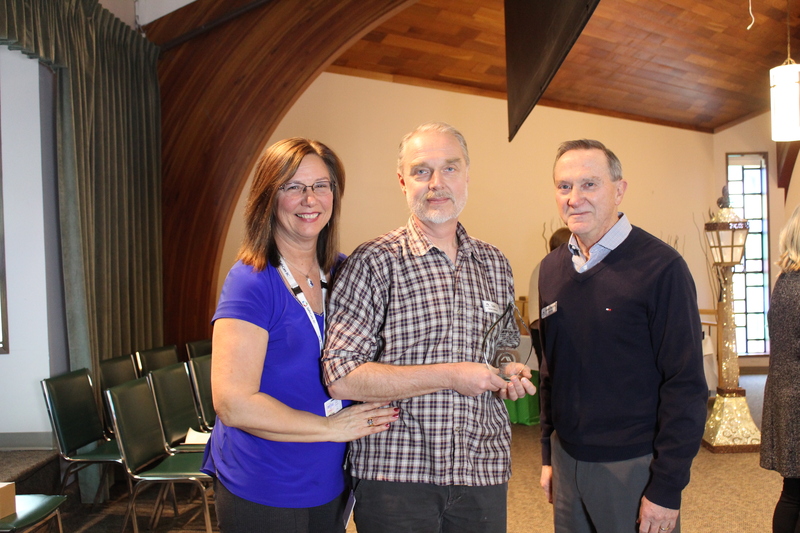 SAFETY CHAMPION AWARD – Recognized by your peers as having a positive influence and commitment to promoting safe work practices at Menno Place. The winner of the Safety Champion Award for 2018 goes to Barbara Boulter. Barb is committed to safety and deserves the Safety Champion Award. She supports Safety by being an active member on the Menno Hospital JOHS Committee. She has motivated and coached her department to do safety training and has training on how to do Safety Inspections. She is on top of reporting Near Misses in order to be proactive in avoiding accidents. Other team members go to her when they have safety concerns and she is a great advocate for safety here at Menno Place. 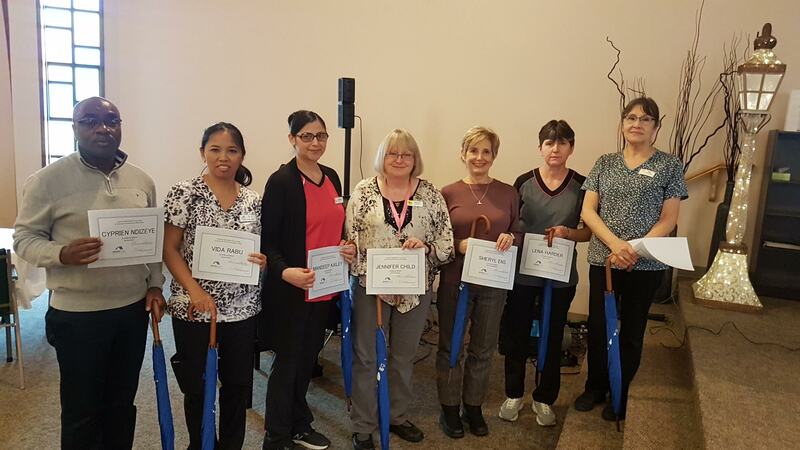 Thank you – Barb, for your commitment to safety which supports the value of excellence at Menno Place and Congratulations on winning the Safety Champion Award! 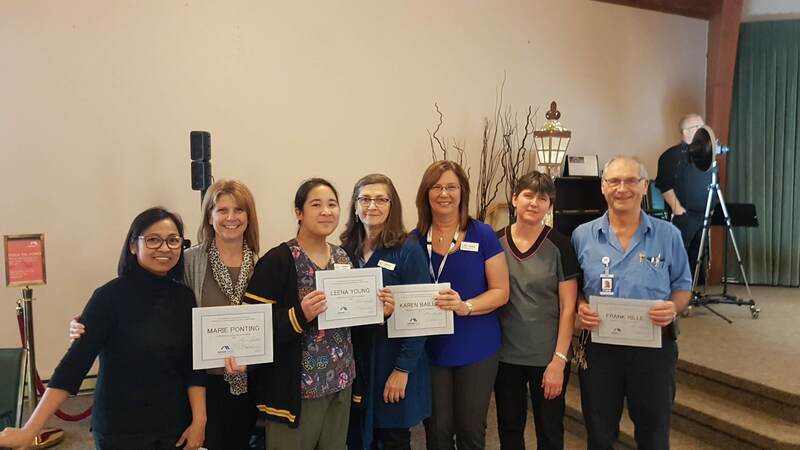 CREATIVE SOLUTIONS AWARD – In appreciation for your outstanding efforts and innovation that have significantly improved the quality of service at Menno Place. The winner of the Creative Solutions Award for 2018 goes to Claire Colvin. Claire, your nominators noticed that you have created many organized solutions that make the residents and family members at the Apartments very happy! They say that you have a system for the guest suites that makes it much easier to schedule a visit and book a suite. They don’t have to worry about getting keys to the guest suite or arriving after hours with the system that you have in place. It all runs so smoothly – and they notice that. On top of this, you are a compassionate person and the nominators love interacting with you. They notice that you speak gently and respectfully to residents even when they approach your desk multiple times each day with the same questions and issues. Your creativity, organization and interactions with our residents has not gone unnoticed! Thank you – Claire, for your commitment to creatively improving systems – this supports the value of innovation and excellence at Menno Place. Congratulations on winning the Creative Solutions Award! 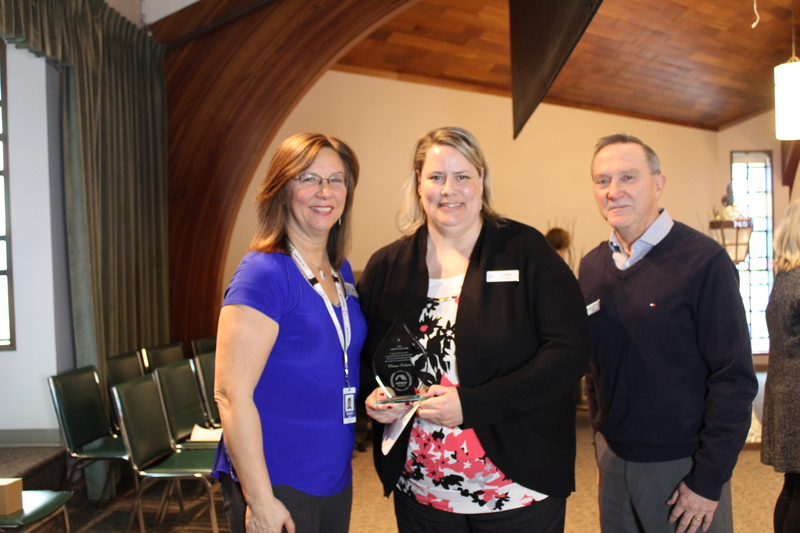 LIVING OUR VALUES – This award acknowledges an individual who shows commitment to living the values of Menno Place which are Stewardship, Excellence, Respect, Values Driven, Innovation, Compassion and Encouragement. This year, we have two nominations which stood out – and we decided to award the Living our Values award to each one. We are pleased to let you know that Dale Carlisle is the first winner of the Living Our Values Award. 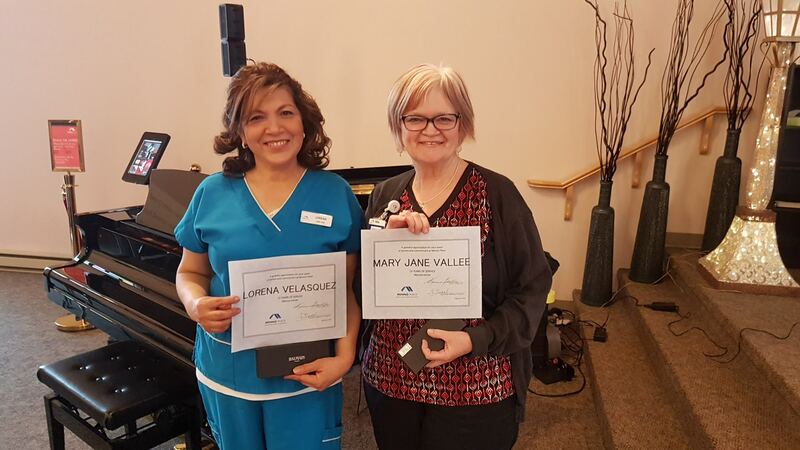 Your way of living our Menno Place values was noticed by many people in both Home and Hospital. The residents look forward to their time with you – not only for the walking program, but because the love the friendship and conversation that goes along with it. You are respectful and enjoy listening to their stories. You give residents choices and are always coming up with new ideas on how to engage those you serve. You go above and beyond in your commitment to providing a better quality of life for the residents. One time, the story is told, a resident shared her story of how she used to make her own noodles and would love to taste them again. You went out and bought all the noodles and stayed after work to make noodles with this woman. She was delighted and grateful and Dale learned how to make noodles! Dale includes residents who aren’t in the walking program in conversation and friendship. He loves to get out on the Duet bike and take a ride down memory lane with a gentle breeze on their hair and faces. You bring such joy, Dale! Dale runs the men’s club at Menno home and this is another time for friendship and meaning. The comradery of the group is meaningful and makes all the difference to the men who join in the program. This past Christmas, Dale purchased a plush sleeping and breathing puppy for the residents – he wanted to see if it would calm and engage the residents who have dementia. He really cares. Dale, you are an encourager, a positive member of our team, a friend, a motivator, a selfless caregiver and a man who lives from the heart! You truly understand “person-centered care” and we thank you for Living Our Menno Place Values! 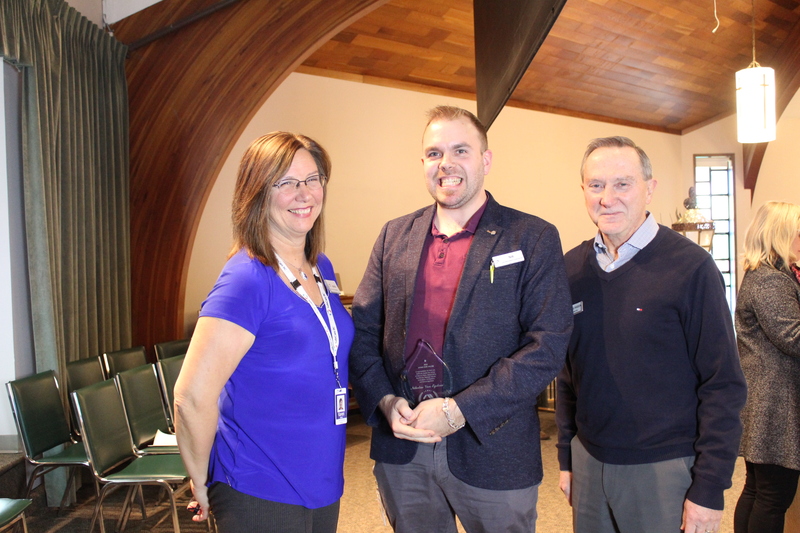 Congratulations Dale for winning the 2018 Living Our Values Award! The second winner of the Living Our Values Award is Nik Van Egdom. Nik, those who nominated you speak of the caring way that you treat everyone. They notice how you give them respect, even when they are shy to ask about technical support for their TVs. You spend your own time after hours helping so many of the Apartments residents with tech support. You fix Bluetooth connections, headphone connections, printers, email and many, many computer updates. It is almost a daily event for you to re-set the Input on a resident’s remote so that they can watch TV once again. On the hottest day this past summer, a resident was expecting to move from one apartment suite to another. Without notice and with no family support, she was admitted to the Hospital. Nik rallied a team of colleagues who moved her entire apartment suite that day. He found a temporary home for her pet rabbit. He communicated with her while in hospital which helped her to manage her anxiety about it all. It was incredibly hot – one of the hottest summer days and yet, without Nik’s leadership and support, her move would have been impossible. Nik has a great sense of humor and many residents anticipate stopping by his office in the Terrace West hallway just to have a chat and a laugh. He is known for walking really quickly through the buildings, but always has time to stop and listen. Like Dale, Nik shares his love of cooking with the residents – exchanging recipes and baking bread for residents and staff on his days off. Nik lifts spirits and he encourages family members and residents in a major transition to living on a campus of care. Nik, who began as a casual cook at Menno Place, moved into the position of Receptionist and then to Life Enrichment Coordinator. He is a problem solver, a “yes-we-can” member of our team and a reliable support in time of transition for residents and families alike. In the past three months, along with the other teams at Menno Apartments, Nik has transitioned 21 residents out of the Apartments and moved 21 new residents in. This means dealing with a different family situation and effectively supporting residents and their families in a transition every 1.5 days. This intensive season involves investing himself in each new person’s life, learning their story, sharing their losses and welcoming them to their new home at Menno Place. You shine in your work, Nik, and this has not gone unnoticed as you were nominated by staff, residents and family members. We thank you for living our Menno Place values! Congratulations, Nik for winning the 2018 Living Our Values Award! That concludes our Awards Celebration. Thank you to the Dietary staff for the awesome food. We appreciate your hard work very much! Thanks to all of you for your hard work and dedication to your jobs! We couldn’t do it without you!